Here's a special little treat that I could not say no to! Would you like a copy of the classic book, To Kill a Mockingbird? Furthermore, would you like to see it on the big screen on Thursday, November 15th!? Read more below! 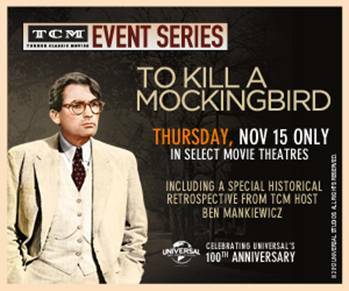 For one day only on Thursday, November 15th, select movie theaters nationwide will show the award-winning film version of Harper Lee's classic novel To Kill a Mockingbird, in an event in honor of its 50th anniversary. In partnership with Fathom Events, Harper Perennial is offering YOU a chance to win 2 tickets for this event, plus a copy of the book! First: Click here for a list of participating theaters to confirm there is a screening of the event near you. Second: Comment on this post and share it with your friends on your own blog/Facebook/Twitter! **A winner will be selected at random by end of day Sunday, October 28th. **To participate, first CONFIRM there is a movie theater in your area. THIS CONTEST IS NOW CLOSED. THE WINNER - as selected by Random.org - IS #16 - Amy at A Faithful Journey. Congrats!! This is AWESOME. There is a showing an hour from us! I had no idea they were going to show it in theaters! How cool! To Kill a Mockingbird is my favorite classic. I love that book! What a cool giveaway! There is a showing about an hour from my house. In the middle of this book RIGHT NOW! How cool! That is the last night of my semester (I teach reading at a community college) AND once-a-year movie night! I am for sure going! Thanks for letting me know; I've never seen the film before! Perfect timing! There is actually a movie theater in my area that is participating! WHOOP! I'll pass on the tickets, but this is an amazing movie (and the book is if anything, even better). One of the most inspiring lawyer movies ever, and a reminder to stand with those who are powerless, even when it is unpopular. I checked and there are 4 theaters within a half hour of me. To Kill a Mockingbird is my favorite piece of fiction, hands down. My son just read it for the first time this summer. He wants to be Boo Radley for Halloween! I have the 40th anniversary edition, but would love to add the 50th to my collection. I got some info about this as well but didn't look into it. I'll go for it! Terry or Amanda could go with me. woo hoo there is a showing here yes! I have never seen this movie and would love to see it. Also, I have been wanting to retread this book for a while. Remind me again, Carrie--have you read TKM? I love how they're showing classics in theaters again! I'd love to go to this one. Off to mention it on FB--does that mean I get two chances at winning? Also I adore this book! It has everything--a clear-eyed look at prejudice and racism, growing up, courage, love. I used to make my students in Mauritania read it. Mentioned it on FB :) Go me! Yes, a favorite of mine; would love to win this!